A universal constructor is a machine that can replicate itself and - in addition - make other industrial products. Such a machine would have a number of interesting characteristics, such as being subject to Darwinian evolution, increasing in number exponentially, and being extremely low-cost. A rapid prototyper is a machine that can manufacture objects directly (usually, though not necessarily, in plastic) under the control of a computer. 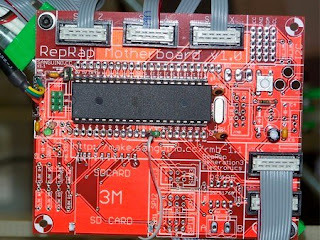 The RepRap project is working towards creating a universal constructor by using rapid prototyping, and then giving the results away free under the GNU General Public Licence to allow other investigators to work on the same idea. We are trying to prove the hypothesis: Rapid prototyping and direct writing technologies are sufficiently versatile to allow them to be used to make a von Neumann Universal Constructor. Impressive as the project and it's goals are, I personally find the miniature-advances in technology being made by the RepRap guys more inspiring than the RepRap itself. The Hack A Day post focused on the motherboard, which is based on the Sanguino platform. This new platform came out of RepRap's need for more functionality than the Arduino could deliver, and is a perfect example of hackers encountering a problem that would normally shut down or severely hinder a project. Then, not only did they find an intuitive way around it that was very useful for many other projects beyond the one that necessitated it, but they gave the solution back to the community as well. That, my friends, is the spirit of the hacker.